Low-cost airlines, also called low-cost carriers, budget airlines etc., are airlines offering sometimes extremely low prices for plane tickets. 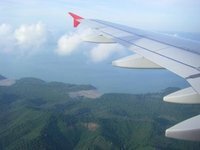 Although nowadays there are dozens, if not several hundreds, of airlines offering these cheap tickets, it started roughly during the 1990s when they became more and more popular. Ryanair and Easyjet are just a few examples in Europe, but there are many more airlines within and outside of Europe. North America, Australia, India and the Middle East nowadays have an abundance of low-cost airlines, which offer great competition compared to the usual (national) airlines. One good thing particularly is the fact that one-way tickets are usually about 50% of a return ticket, unlike usual airlines where one-way tickets sometimes are even over 100% of a return ticket! Of course, you have to bear in mind that these cheap tickets do mean that there can be disadvantages as well. You usually have to pay extra for things like food and drinks, as well as checked-in luggage. Also, in some cases, the times you are able to fly are mainly during the late evening or early morning (not always though!) and some airlines mainly use airports that are located further away from the main cities you want to fly into. It's also necessary mostly to book as far ahead as possible as tickets prices rise the closer you get to the date you want to fly. Sometimes this even means that regular airlines offer better value when booking just weeks, let alone days, before flying. With some patience and persistance it's possible to book a Round the World ticket for considerably less money if using low-cost airlines. The main disadvantage is that you have to arrange quite a few tickets which are fixed for a specific date and changing might be impossible, unless you want to buy another (probably more expensive) ticket for a different date. It's mainly a fixed route, which means that flying from A to C via B means that you have to pay for two separate tickets plus the fact that you have to collect luggage and check in again for the next flight. Like already mentioned above, not all countries, even continents, have low-cost airlines. Especially Africa and Latin America have few, if any, possibilities to fly cheaply. You have to rely on discount tickets with regular airlines or hope that there are relatively economical airpasses for example, although the latter are actually becoming more and more rare. Most of the low-cost airlines mainly serve short-distance flights. Intercontinental flights are still pretty rare, though Air Asia X is one of the best examples which does have long-distance flights. Unfortunately, one of the first to offer long-distance flights (Oasis Hong Kong), has ceased operations after a short period (London - Hong Kong). Another example was Canadian-based Zoom Airlines, which had flights throughout the Americas and even trans-Atlantic flights to Europe. Below is list of most of the major low-cost airlines throughout the world, subdivided by continent and country. For more information, check the websites of the respective airlines to see routes, schedules, prices and, not unimportant: rules! New destinations are added constantly and some routes have ceased operations all of a sudden as well. Things change constantly, so it's best to check the respective website of the airline. Although not officially a low-cost airlines, Leeward Islands Air Transport (LIAT) does serve quite a few islands in the Caribbean at very reasonable prices. This is version 33. Last edited at 17:51 on May 21, 13 by Sander. 55 articles link to this page.